However, the Tailwind tribe trend, is one that I have chosen to embrace. Why? Because I can see the benefits for me and my TpT business! What exactly is a Tailwind tribe? Tailwind tribes are in the early stages of development from Tailwind. It is a secret Tailwind board that is set up so that you and multiple others can pin content to it. Then, when you are ready to add good pins to your queue, you have a pool of good content to choose from. Just type in your board and click schedule. What are the benefits of tribes on Tailwind? Well, I already mentioned the benefit of having good content to share. In order to have successful Pinterest boards, you have to have good content. Tribes help solve this problem. The other BIG (maybe even bigger?) benefit is that the other members of the tribe are sharing YOUR content. How is it different than a pinning party? In the pinning parties I’ve experienced, it is “ I’ll share yours if you share mine” and then post whatever you want, free-for-all, and sometimes end up pinning pins or products that are either in direct competition with your own or are not a good fit for your audience. 1. First and foremost, people must share high quality content. 3. All pinners must be willing to follow the rules of each tribe. Tribes are still in the early stages, but I trust Tailwind to continue to make this a great resources for Pinterest-using teacherpreneurs. Would you like to join my Tailwind Tribe? In the sprit of the grand experiment that is internet marketing, I have created a tribe: Classroom Management, etc… for classroom management, organization, bulletin boards, class rewards, and all that fun stuff. If you would have great content in that area or are looking for great content to share and would like to join, just send me an email to sarah@morethanaworksheet.com and give me your email address, and I’ll send you an invite. Have you tried tribes yet? I’d love to know your thoughts! You know how when you’re dating someone, and you think that you’re both serious, so you have the DTR talk? (DTR meaning Define the Relationship.) Well, if you are serious about using Pinterest as a valuable marketing tool, then it is time that you DYA: Define Your Audience. Seriously, knowing your audience is one of the most important keys to Pinterest success. By audience, I mean, the people who you want to visit your store and buy your resources. These are the people who you want to find your boards and see your pins. In order to get your content out there, you need to pin what your audience wants to see. You cannot pin what your audience wants to see if you do not know your audience. 1. What is the one big word that describes your audience? 4. What are they looking for? 5. What are their challenges? 3. What do they value? Creativity, rigor, critical thinking, engagement, higher level thinking, their time. 4. What are they looking for? Printables, teaching ideas, tips, timesavers, recommendations, resources to buy. Now, can you define your audience in just one sentence? Here’s mine: My ideal audience is made up of 3-5 grade multi-subject teachers who are looking for resources that promote higher level thinking, save time, and address the curriculum in a creative yet rigorous way. Pin things that they want to see! I like to keep a constant stream of fresh and fun pins going out to my followers. I want them to think, “Wow, More Than a Worksheet is always pinning good stuff!” This is impossible to do if I am only pinning my own products and blog posts because, well, I have a limited number of products and blog posts. I get tired of seeing the same old stuff all the time, so I imagine my followers do too. Here are some of the strategies I use to find good pins to share with my followers. Keep in mind that this is in addition to my own products, blogs, and freebies. 1. Start with your feed. Since Pinterest uses a smart feed, they handpick (computer pick) what they think you want to see. This is based on the types of boards you follow, the types of pins you pin, and the things you search for. To keep my feed fresh, I do try to follow new boards often. 2. Other great boards. Find some other excellent pinners with a similar audience to you, and pin things from their boards. They will appreciate it because you are helping to get their pins seen, and Pinterest seems to reward pinners who play nice with others. 3. Pin seasonal pins. Pinterest, TpT, and teaching in general is very seasonal. Right now, it is almost April, so you should be pinning things for spring, poetry month, test prep (ugh), and Earth Day. 4. Pin what teachers are teaching. In many cases, teachers across the country are teaching the same concepts at around the same time. For example, right now many teachers are teaching about plants and will soon begin teaching about animals. If you are in the classroom, pin things based on what you are teaching, and chances are others are looking for those resources, too. 5. Keyword Searches. TpT used to send out a list of keywords from the past months. You can find the old ones in the forums. I use those and periodically do searches with the Pinterest search bar and pin items that come up. I also look at the keywords that brought people to my blog. 6. Blogs. Find good content directly from blogs that you follow. I have heard that Pinterest rewards you for introducing new content. This is also good blog karma because other bloggers will appreciate that you are sharing their content. Plus, it gives your followers fresh, new teaching ideas. 7. Pin some of your old pins. I keep a board that is just full of pins from my blog. So I will often go back and pin things that I haven’t pinned in a while. Even though it’s my own stuff, I think it is ok because it is just another great article among all of my other pins. 8. Pin what’s popular. Whatever is selling for you now, pin that and similar items and pins. (I usually don’t pin competing paid products, though.) Also, when you go to search on TpT, it gives you a list of what’s popular. If it’s popular on TpT, it may be popular on Pinterest, too. 9. Bonus: Move your pins around. I know the title says 8, but I just thought of this as I went to do some pinning. Often my pins can fit onto more than one board. So another way that I find things to pin, and this is especially good when I am in a hurry, is I move pins around. I have some boards that are very specific and some that are very general. For example, I may go to my "Math Teaching Ideas" board, since I've carefully chosen all of the pins that are there, and I might pin a handful of those pins to my "Elementary Classroom" board. Since not everyone sees everything you pin anyway, I like to shuffle pins around. Again, this is all in addition to my own blog posts, products, and freebies, all which I sprinkle in among all of the other good content. But Sarah, I don’t have time for all of that! Don’t worry. This isn’t a daily pinning strategy. I usually spend about an hour or so a week, on one particular day, filling up my Tailwind queue for the coming week. I may or may not do all of the above, and I definitely don’t do them all at one time. What if I don’t use Tailwind? That’s ok too! Before I started scheduling my pins, I would just try to pin for about 10 minutes each night. If you have a few minutes here or there, or you like to pin while watching TV, just choose one of the tips and go for it! To start with, aim for 10-20 quality pins per day. When Pinterest first popped up in the social media world, I immediately LOVED it. I have always been a hoarder of online ideas but I found that when I saved them as bookmarks, they were hard to keep track of. So I resorted to saving them in a word document, but I had a hard time remembering why I saved a particular link, and my word document was beginning to feel like an annotated bibliography. As you can see, Pinterest completely solved my problem! Disclaimer: I have not tried other pin scheduling tools, so I am not able to make a good comparison. This is just based on my experience with Tailwind. Tailwind tells me when I have already pinned a pin to a certain board. This is huge, as I like to recycle my pins to keep them flowing through my followers’ feeds. If I go to pin a pin that I've already pinned (tongue twister?) then it immediately gives me a notification and tells me the exact day when I last pinned it. It is automated. You can do all of your pinning for a week in an hour, and then you have a constant stream of pins going out to your followers. It pins at optimal times. Before, I would just pin a whole bunch of stuff at one time, usually late at night after the kids were in bed. 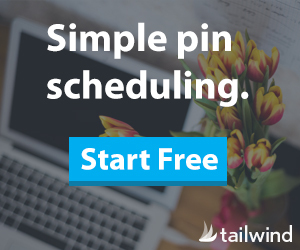 Tailwind, spreads it out, and it gives you suggestions for a pinning schedule based on when your audience is most active. You can decide how many pins to pin each day. It’s easy to set your schedule for as many or as few pins per day as you choose. I’ve experimented with different numbers, but right now, I schedule around 30 pins per day. The customer service is incredible. They are super helpful and quick whenever I have had a question, and they genuinely seem to care about making Tailwind work for us as teacherpreneurs. You can pin from any site. Just like the Pinterest button, you install the Tailwind browser plugin, and then you can just click on the little feather when you want to pin an image. You can pin the same pin to multiple boards and spread them out. When you choose multiple boards for a pin, you can also choose an interval. For example, I released a new STEM freebie, and I scheduled it to go out to several boards: More Than a Worksheet TpT Store, STEM and STEAM, Science Activities, Elementary Classroom, and Free Teaching Resources. Then, I set an interval of one day, it will pin that pin to the first board, and wait one day before pinning that same pin to the next board. My Pinterest relationship is less personal. I find myself scheduling everything, which saves time, but I don’t always know what is going on with my Pinterest boards. I have to remind myself to actually visit my boards, which I do think is important to do so you can look at them, get a feel for them, and see what is getting repinned. You have to be careful with collaborative boards. I have accidentally scheduled a pin to a collaborative board that was already there. It only tells you if YOU pinned the pin to the board, not if someone else did. I’m a little OCD about the collaborative boards that I am a part of, so I typically end up manually pinning pins to those boards. When you schedule them, you don’t know what others are scheduling at the same time. Less engagement. On Pinterest engagement is good. I find that since I started using Tailwind, I am less likely to like, comment, and repin pins as they pop up. Again, I know it’s on me to make that effort, but I just wanted to share with you something that I noticed with myself. 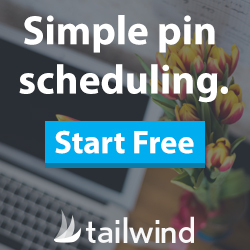 Have you tried Tailwind yet? I would love to hear if you have any additional pros and cons that you have found. I want to get a little personal today and share with you a problem I have. Super Target. Whenever I go to Super Target, I end up staying longer than I intended, browsing in more aisles than I planned, and buying things that weren’t on my list. I can’t say I didn’t need those things. I just didn’t know that I needed them until I got there. You see what I’m getting at? You want your blog and TpT store to be like Super Target. People find their way there and end up staying, browsing, and shopping. How does Pinterest fit into this analogy? Pinterest is like the Super Target flier. The purpose of pinning your blog posts and products is to bring traffic back to your blog or store. Then, hopefully your new visitors will like what they see, browse around a while, follow you on social media, and make purchases. However, even if your blog looks amazing, and your first product is outstanding, if you don’t have things for shoppers to browse, then hold of on Pinterest. Save your Pinterest efforts for later. If you are just starting out, your time is better spent in product creation. People can’t buy it if you haven’t created it. When should you start pinning your products and blog posts? Everyone will be different, but in my personal opinion, you should wait until you have at least five very helpful blog posts and at least five outstanding paid products. This way, when people find their way into your store or blog, they have a few aisles to browse, and they may find things to buy that they didn’t know they needed. Otherwise, they come, see your one post or product, and then move on to TJ Maxx. If you are still in the beginning stages, that doesn’t mean you should be avoiding Pinterest altogether. At this stage, you should be creating your boards , building your following, and finding engaging content to fill your boards. When I first started using Pinterest for marketing my TpT products, I did what a lot of teacherpreneurs before me and after me have done. I joined pinning parties. There wasn’t even an entire Pinterest thread on the forums back then, but I jumped in nonetheless. There are many reasons why I did. First, it seemed like everyone else was doing it. Second, it made sense. More people pinning my products, of course that’s a good thing. Third, Pinterest is confusing, and I didn’t know what else to do. We are teachers. We are entrepreneurs. We like to do stuff. We like to make things happen. When you don’t know what to do, most of us choose doing something over doing nothing. And pinning parties are that something. 1. You are pinning competitive products. When you pin other products, you are creating competition for yourself. Yes, there is a lot of coop-etition on TpT. We collaborate. We share. We help each other. That is great. I will happily share a great freebie or blog post that I find useful because that is directly helping my audience. I am adding value. I am helping a TpT friend. I never pin a paid product that directly competes with one of my own. I can guarantee you that Apple does not pin Dell computers to their Pinterest boards or vice versa. 2. You are misleading your audience. Part of being successful on Pinterest is building a following made up of your ideal buyers. When you pin something, your audience trusts that it is high quality, fitting with the brand you have built for yourself. With many pinning parties, you are vouching for something that you haven’t tried out or even seen the full version of. 3. Your pins are not going to the right audience. There are so many different niches, audiences, subject areas, and grade levels on TpT. Someone who follows a third grade teacher on Pinterest does not care to see a pin from an 11th grade English teacher. Many of the pinning parties that I reviewed had pinners and products from all grade ranges and subjects. 4. Your pins are not getting repinned. Stay with me here. Yes, your pins initially get repinned per the rules of the pinning party. It is enticing to see your initial repin count go up. I get it. But what happens to pins after that initial repin? I decided to do some investigative work, and I followed the pin trail on some of the most popular pinning party threads on the TpT forums. After the initial repins from the thread, almost all of the pins that I checked had 0 repins from the second board. I know this is not scientific, and I don’t have time to check all of the pins. But you can follow the pin trail of your own pinning party pins by clicking on the repin icon. This will show you the boards where they go, and you can then find your pins and see the repin count from there. The pinning parties that I have experience with are ineffective and do not make good business sense. Perhaps, there is a better way to do pinning parties. I don’t know. But I do think there are better ways to spend your Pinterest time like building a following, pinning the right pins, and building the right boards. Don’t worry, I have an answer. Are you ready? The answer is: It all depends. 1. It depends on your purpose. Why are you on Pinterest? What do you hope to accomplish? If your purpose is to annoy people, have no followers, and create boards that nobody sees, then by all means, pin your product covers. Pin them often, pin them exclusively, and make sure the text is in Comic Sans. In case you didn’t pick up on it, the above advice is sarcasm. Do not do that. I only took the sarcastic route there because that is my inner voice talking to myself as a budding teacherpreneur. That is what I did. Seriously. I have so many cringe-worthy pins floating around out there, and I made sure to pin them. A lot. That was one of my biggest mistakes when I first started. My logic was: My products are good. I want people to see my products. People are on Pinterest. I will post my products on Pinterest. I want more people to see more of my products. I will post my products on Pinterest more, more, more. It makes sense, but that logic does not work on Pinterest. Trust me. Many teacherpreneurs at the beginning made the mistake of going pin crazy with our own products. So if you've done that, just know, you are in good company, and it's ok. You can change your ways. If your purpose is to get your products seen, gain real followers, and grow your business, then pay attention to #2. 2. What you pin on Pinterest depends on your ideal audience. Why are they on Pinterest? What do they hope to accomplish? -Who do I hope sees my pins? -How would I describe my ideal follower? -What does my ideal follower like? -What does my ideal follower need? -Why are the on Pinterest? Once you have considered and thought about your ideal audience, begin by pinning and repining things that would be useful to them. You will hear this over and over, but you need to add value. Your Pinterest boards should be a valuable wealth of resources and ideas for teachers (or whoever is your ideal audience). When your pin boards are valuable, then your followers do not see your products as spam or something annoying. They see your products as just one more really valuable thing that you post. So, to wrap it all up: what do you pin on Pinterest? Valuable pictures, tips, ideas, freebies, blog posts, articles, quotes, or anything else that would be useful to your audience. And inside all of that, sprinkle in your own resources, too!